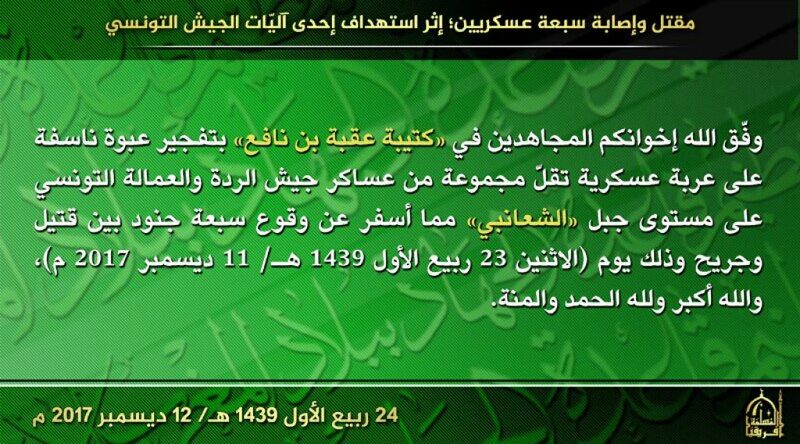 Al Qaeda in the Islamic Maghreb’s (AQIM) fledgling branch in Tunisia, the Uqba bin Nafi Battalion, claimed credit for Monday’s ambush on Tunisian soldiers in the Mount Chaambi region of Kasserine Governorate. Yesterday’s statement is just the second claimed attack by the branch this year. The claim was released by AQIM’s Ifriqiyah Muslimah channel, which has released statements for the battalion in the past. The jihadist statement claimed that members of the Uqba bin Nafi Battalion detonated an improvised explosive devices (IEDs) on aTunisian Armed Forces military vehicle as they were on patrol in the Mount Chaambi region. It also claimed credit for killing and wounding six soldiers, figures that largely correspond with what was reported by local media. According to those reports, one soldier was killed in the ambush, while another six were injured. Following the ambush, Tunisian forces responded by shelling the region with artillery and launching airstrikes against militant positions. The last claim from the al Qaeda wing came in April. In that ambush, the Uqba bin Nafi Battalion claimed to wound two soldiers in the Mount Ouargha region of Kef Governorate. Between that IED and Monday’s ambush, the group has faced some serious setbacks. In August, a Tunisian military operation killed the group’s overall leader, Mourad Chaieb, and others were arrested. The group’s media releases independent of other AQIM channels slowed to trickle. Uqba bin Nafi has claimed several other assaults in the area over the last three years. In Dec. 2014, the jihadist group claimed two attacks on Tunisian forces in the Mount Chaambi region, posting photos from the raids days later. Just two months later, it took credit for killing four soldiers in an operation in Kasserine In Aug. 2015, it killed a customs agent in Bouchebka. In the initial claim of responsibility released for the Aug. 24 strike, the jihadist group said that it ambushed a number of customs agents, “killing a group of them.” It also said that it took three weapons, identified as Steyr AUG’s in photos released from the attack. In Aug. 2016, it claimed a deadly ambush in the Mount Sammama area of Kasserine Governorate. That assault left three Tunisian soldiers dead and seven others wounded. A month earlier, the jihadist group claimed targeting the military with two landmines, killing one soldier in the Mount Sammama area. While Tunisia has been relatively stable, it faces a residual jihadist threat. This is largely from the Uqba bin Nafi battalion, which continues to target Tunisian security forces and harass the local population. However, Tunisia also faces a threat from the Islamic State. In 2015, the small North African country saw a spate of attacks conducted by the Islamic State. This includes the terrorist attack on the Bardo Museum, an ambush on a popular beach just three months later, followed by a suicide bombing in the capital Tunis in November. In March 2016, the Islamic State also claimed an assault on the Tunisian town of Ben Gardane near the border with Libya. The four Islamic State strikes left a total of 93 people dead and over one hundred wounded.